I had been looking for a description of the role of the centre forward and after a bit of searching I found the above on Wikipedia. It sums up more or less what I thought the role involved. But why didn’t I trust my own judgment in the first place? After decades of watching football surely I knew what a centre forward should do. But events over the past year or so had clouded my judgment. My boyhood hero as a centre forward was Harry Lyon. Lyon was by no means a giant, but he had the jumping technique to out-do defenders on high crosses. He certainly scored the majority of the goals for Latics in his heyday. In fact he netted a remarkable 67 times in the 1964-65 season. But the following season saw his goalscoring tally drop, when he scored less than his strike partner Bert Llewellyn who got 49. Lyon was a scapper, lacking elegance in his tussles against opposition defenders, but he would always chase the long ball and fight hammer and nail to hold possession. Memory fades, but I don’t recall Harry as the kind of player to provide through balls into the box, but his strike partner would be there sniffing for the rebound of one of his ferocious shots. Llewellyn and his predecessor at Wigan, Carl Davenport, were good at putting those loose balls in the net. But football has changed since Lyon’s day. Defenders are much fitter and most teams have a couple of large guys in the centre of defence who are very good at clearing the ball, especially if it is in the air. For decades after Alf Ramsey brought in 4-4-2, teams used that system. The twin strikers would tussle with the twin central defenders of the opposition, but after a while the fashion changed. Perhaps it had become too easy for those central defenders. Marking for them had been straightforward – you take one and I take the other being the order of the day. They were later to be faced with just one central striker, with support coming from the flanks and the midfield. Their roles became more complicated, sometimes confusing. In the higher levels of English football not so many teams now play 4-4-2. The job of the centre forward has become an almost thankless task, extremely physically challenging in having to chase balls and hold up against often two big defenders. Then he has to have the energy and enthusiasm to mount attacks on goal. Not surprisingly good centre forwards are hard to come by in this day and age. Some are good at scoring goals, but not so efficient in chasing lost causes and holding up the ball. Others are the reverse. The average goal tally for a centre forward has not surprisingly dropped, given his onerous other duties. However, this does not mean that modern day systems don’t work. The top teams have midfield players moving into the “hole” behind or to the side of the centre forward, notching opportunist goals. Those typically towering central defenders have a hard time coping with their runs. Uwe Rosler was clearly a disciple of the “modern” approach. In his first season he often used MAF – Marc-Antoine Fortune – in that lone centre forward role, with two players wide of him. Fortune did a good job in holding up the ball and worked hard. MAF had been used sparingly by Owen Coyle, with Nick Powell being on the scene, but Rosler often used him as the target man following Powell’s loss of form and Grant Holt’s fall from grace. Over the course of the 2013-14 season, MAF was to make 17 league starts, with 20 appearances off the bench. He scored four goals. Rosler had clearly decided that MAF would not be his first choice centre forward when he signed Oriol Riera before the beginning of last season. This was underlined when Andy Delort was signed just before the close of the summer transfer window. But neither of the two overseas players could settle in their roles. MAF was brought back in. In Malky Mackay’s first game in charge in late November, Latics were home to Middlesbrough. MAF was given the lone centre forward role, with Callum McManaman and Shaun Maloney playing wide. MAF was to become a regular fixture in Mackay’s teams, even when he switched to 4-4-2. Fans had been hopeful that more goals would come with a switch to the system that had done Latics proud in their heyday. However, Mackay was to pair up MAF with James McClean, a winger playing as a central striker, or Leon Clarke, a journeyman who rarely delivered. Mackay had scorned the idea of linking him up with Billy Mckay or Martyn Waghorn. By the end of the season, MAF had made 27 league starts, with 8 appearances off the bench and scored one goal. MAF had become a feature in the Mackay era through his ability to chase those lost causes and hold up the ball. Although he offered a minimal goal threat the team often suffered when he was not on the field. MAF had become an important cog in Mackay’s long ball tactics. MAF was like Marmite to Wigan Athletic fans. You either loved him or you hated him. Despite his whole-hearted play and willingness to sacrifice for the team, few loved him. MAF had become synonymous with the most disappointing season in living memory for most fans. At Wigan MAF had become the target man, not always his role at previous clubs. Indeed at West Bromwich he had often been played wide. Perhaps Latics would have got more out of the player if they had done that. MAF’s career record as a goalscorer was weak when he arrived at Wigan as a 32 year old, but playing as a lone centre forward helped make it even worse. Moreover his concentration could lapse and he could too often be caught offside. We might well ponder what might have happened if Latics had persevered longer with the overseas strikers, Delort and Riera. Had they been written off by the coaches or was it an economy measure to send them off on loan in January? On top of that, the reluctance of Mackay to give Waghorn and Mckay a genuine chance was hard to fathom, given the impotent strike force he was regularly fielding. There are fans who even suggest that Latics have avoided relegation if Mackay had not so often fielded MAF. MAF sadly became the scapegoat of an awful season. Unlike Harry Lyon he could not score goals. Neither could he make assists. MAF is by no means a bad footballer, neither does he shirk in his duties. But he is not a goalscorer. We wish him well in his next move. Is Martyn Waghorn back in from the cold? The words of Malky Mackay after Martyn Waghorn’s spectacular late equalizer saved a point against a poor Bolton side. Mackay will win some journalistic praise for an inspired substitution. After all it helped Wigan share the points when it looked like the opportunity had passed. But the truth is less palatable. Mackay frequently shoots himself in the foot, not only in his team selections, but also with what he says to the media. This was another example. Once more Mackay started the game with a striker who is way short of his best form and another who cannot score goals. Despite Leon Clarke’s poor performance against Watford the big man retained his place. Inconsistency has dogged Clarke throughout his frustrating career. Although he has genuine physical presence and can score goals, his record should be enough to tell Mackay that he is not a man to rely on for goals on a regular basis. At 30 years of age he has been the ultimate journeyman. His history shows him joining new clubs but soon being sent out on loan. Clarke is now in his 11th loan period at a club, after Wolves manager Kenny Jackett decided he did not need him for his promotion push. At his best Clarke can play the bustling centre forward role with distinction, as he did for Coventry City in 2012-13 when he scored 23 goals in 34 appearances for the League 1 team. The other side of the coin is a player who appears languid and disinterested, too often caught offside, at odds with management. What is in Mackay’s head when he makes quotes like the one above? Even the most supportive of fans would have to ask him why he continues to play Marc-Antoine Fortune upfront. Is MAF there to score goals? If goalscoring is what forwards are for then the French Guianan should surely not be playing there. Martyn Waghorn’s reaction to his goal might well have sent a message to Mackay. Since the Scot’s arrival Waghorn’s main role has been that of a bench warmer. He has not been given a single start despite his proven ability to score goals at Championship level. Given the woeful lack of fire power in the Wigan attack Mackay’s unbending approach and loyalty to some players at the expense of others gives great cause for concern. Do divisions still remain within the camp? Once again Mackay named a lineup that did not have a single player in it who was signed by Uwe Rosler. William Kvist – perhaps Rosler’s most successful signing – remained on the bench until the 78th minute when he came on for Emmerson Boyce. Boyce is an icon, a hero of the heights that the club reached in the Premier League era. At his peak he could match many of the best right backs in the country. But now his speed has gone and it leaves him defensively vulnerable. Kvist should have been on from the start with James Perch playing at right back. Waghorn was Rosler’s first permanent signing at the club. He was an integral part of a team that finished in 5th place last season. Waghorn does not have the height of Clarke or Fortune, neither is he particularly fast. However, he has a great left foot and has the ability to be in the right place at the right time in the penalty box. Last season his excellent delivery from corner kicks caused problems for opposition defences, something that has been lacking in Mackay’s Wigan teams. “We’ve managed to bring in another couple this week, young Jerome for a little bit of experience and Josh, who showed his potential in the second half against Watford”. His signing of Jerome Sinclair in particular raised the eyebrows of many fans. Some welcomed the arrival of a young talent from Liverpool with a fine goalscoring record at youth and development squad levels. Sinclair made an inauspicious debut against Watford, coming on in the 82nd minute. He did not make the bench yesterday. Sinclair’s signing must have sent shock waves in the direction of both Waghorn and Billy Mckay. The Scot did actually get a place on the bench, but Waghorn was totally omitted. But the larger question remains as to why, with just 9 matches left and with League 1 getting closer and closer, Mackay wanted to give experience to an 18 year old Liverpool player who had played just 9 minutes of first team football, that being almost two years ago. Liverpool must be delighted in Mackay giving their youngsters an opportunity for first team football. Since his first appearance against Bournemouth on February 7th the 17 year old Sheyi Ojo has now played in 10 matches, including 5 in the starting lineup. Although clearly a talented player Ojo has not surprisingly struggled to assert himself against rugged Championship defences. He might well produce some match-winning magic before the end of the season, but he is there at the expense of other players. 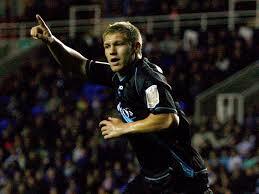 Martyn Waghorn was largely used in wide positions by Uwe Rosler. Moreover Mackay talks of the talent in his development squad, but has still not given any of them first team experience, apart from warming the bench. The bottom line is that Mackay is concentrating on young developing players from other clubs rather than his own. Josh Murphy got his debut yesterday and might well be a regular feature in the upcoming matches. Despite his two superb free kicks at Rotherham, Jermaine Pennant is way past his sell-by date. He has started in 7 games so far and has not managed the full 90 in any of them. In fact he longest he has lasted has been 77 minutes and 84 minutes in his first two appearances. He went off after 66 minutes yesterday and 54 minutes in midweek. Murphy is only 20 years old, more mature than Sinclair or Ojo, but sadly lacking in prior experience at senior level. He started in only one league game for Norwich this season. In fact most of his experience this season and last has been off the bench. Like Liverpool, Norwich must also be delighted that Latics are giving their young player invaluable first team experience. To a large degree Mackay’s use of the loan market has been necessary. Losing 13 players in January left a big hole in the squad. However, bringing in young loanees with no real first team experience when relegation threatens smacks of desperation or trying to appease other clubs. Moreover the young loanees have been brought in at the expense of players on long term contracts at the club who have been starved of first team opportunities, let alone the youngsters who have come through the club’s own academy. Let us hope that Malky Mackay is not as unbending as he appears. James McClean will return from suspension for the next game at Middlesbrough on April 3rd. Played on the left wing he could have a major role to play in keeping Latics afloat. But one has a sneaking suspicion that Mackay will once again play him in a striking role. On the positive front Mackay has built a team with much more solidity in defence. However, his doggedness in persisting with a strike force impotent in its delivery could cost Latics their place in the division if it continues. One hopes that Martyn Waghorn made a point with his brilliantly executed goal yesterday. The question is whether Mackay is willing to open his eyes, see the faults in his planning and take steps to rectify them. Or is he going to be unbending? So said Peter Grant when Marc-Antoine Fortune signed for Celtic in July 2009. Grant had moved to a coaching position at Celtic after a spell at West Bromwich Albion, where he had previously worked with the French Guianan. Celtic had paid Nancy a fee of £3.8m for “MAF”, after he had impressed in a loan spell with West Bromwich in the second half of the 2008-09 season. MAF had become a fan favourite at the Hawthorns and after 18 appearances and 5 goals he was voted ‘’Player of the Season”. Sadly times have changed for MAF. 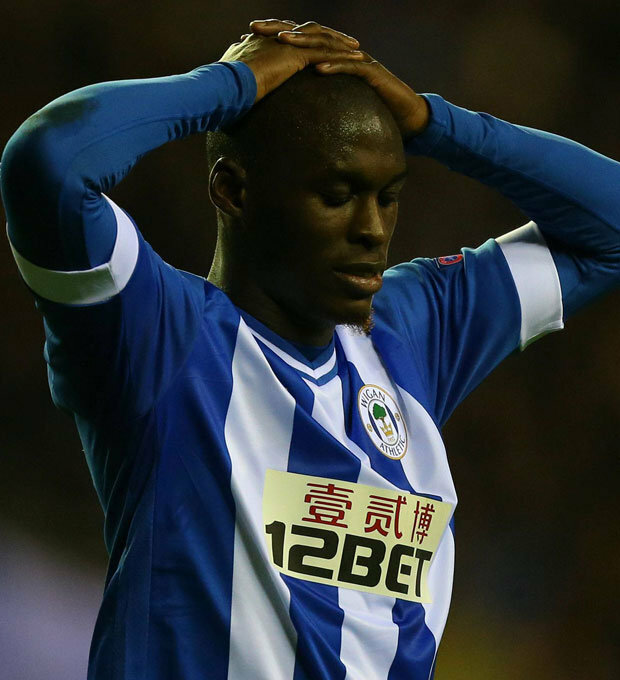 A mere mention of his name among Wigan Athletic supporters will cause controversy. The player appears shot-shy, unwilling or unable to make the probing runs off the ball that are expected of a striker. But despite a record of 7 goals in 70 appearances (including 43 starts), MAF continues to figure prominently in Malky Mackay’s plans. It causes a considerable amount of consternation among the majority of fans. Put simply, how can a player with such a striking record regularly make the starting lineup? However, MAF does have his supporters who will say that he is a real team player, with his strong hold-up play and willingness to chase. Moreover on occasions when he has been substituted during the course of a game, Latics’ play has got worse, not better. The team so often seems to play better when he is on the pitch. At 33 and nearing the end of his contract, will there be a possibility of him staying at Wigan? He has never been a prolific goalscorer, but there have been spells at clubs where his record has been well within the acceptable range. Is he at the end of his career now or can he still show that he can score goals more often? That move to Celtic had been potentially the high point of MAF’s career, but despite scoring 10 goals in 32 appearances for the Glasgow club, he could not live up to his price tag and new manager Neil Lennon shipped him off to West Bromwich a year later. MAF was not able to relieve his previous highs in his second spell with the midlands club, but nevertheless stayed with them for three more years. He was to score 10 goals in 62 appearances. When Owen Coyle took over as Wigan Athletic manager in the summer of 2013 he had a major rebuilding job to do with a squad that had been decimated following relegation from the Premier League. Coyle had been given a year to get the club back into the Premier League. His recruitment plan was to largely focus on seeking experienced professionals who had played in the Premier League. In his signing of Grant Holt and MAF it looked like he had found a good blend of strikers. Holt was the bustling, goalscoring centre forward, with MAF the foil, through his unselfish and hardworking support. Sadly the partnership never really got together , with Holt dispatched off on loan in January. Their lack of success had drawn criticism from many fans of Coyle’s signing of two 32 year olds on long term contracts. With the departure of Holt on loan the focus fell more and more on MAF. Under Coyle he had made 19 appearances, which included only 8 starts. His solitary goal had come ironically from a superb crossfield pass from Grant Holt at Yeovil. However, he was to find favour with new manager Uwe Rosler under whom he made 15 starts and 15 appearances off the bench, scoring 4 goals. When Oriol Riera and Andy Delort were signed early on in the current season, and with Martyn Waghorn’s proven goalscoring record, it had looked like MAF would fall well down the pecking order. But he has come bouncing back. Riera and Delort are gone, Waghorn is marginalised and new signing Billy Mckay finds himself warming the bench. MAF has weathered the storm, working under three managers at Wigan, all of whom have shown faith in his abilities. So far this season MAF has made 22 starts, with 5 appearances off the bench. He has scored 2 goals and made no assists. The last time he scored a goal at the DW Stadium was in February 2014. Despite the value MAF might add through his hold-up play and commitment can Malky Mackay continue to justify his inclusion in a team desperately short on goals? Has Mackay considered playing MAF wide on the right, where he can play an effective role but not labour under the burden of scoring goals? The controversy appears set to linger on until the end of a bitterly disappointing season. Will it be 4-4-2, 4-3-3 or 3-5-2 for Latics? Harry Lyon latches on to a Walter Stanley (third from right) cross. Carl Davenport lurks for any rebounds. In the mid 1960’s Allan Brown’s Wigan Athletic team played the kind of football fans liked to watch. There were two excellent wingers, Les Campbell and Walter Stanley, who would put over a stream of tantalizing crosses for the twin strikers to feed on. 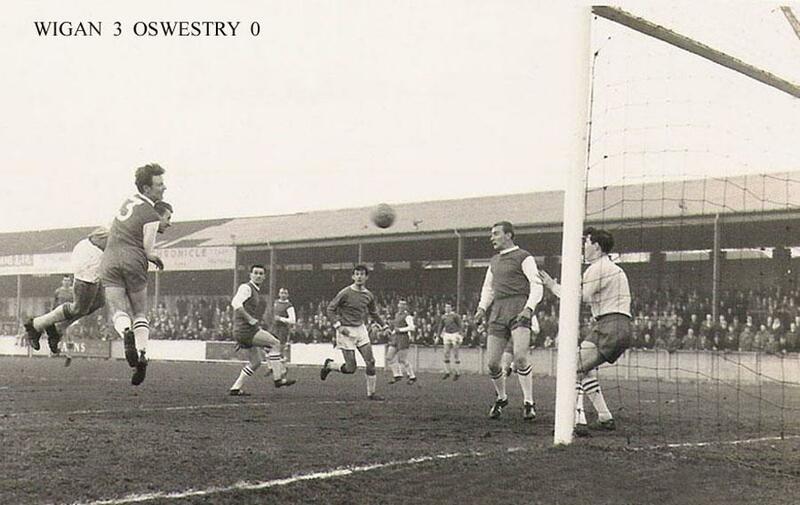 No wonder that Latics scored 121 goals in the 1964-65 season, when they won the Cheshire County League. Harry Lyon led the scoring with 67 goals in all competitions. Football was an attacking game in those days, with 4-2-4 prevalent. Then came England’s World Cup victory in 1966. Alf Ramsey’s team played without wingers, the ‘wingless wonders’ . They packed the midfield with four players, leaving just Geoff Hurst and Roger Hunt up front. With the rugged Nobby Stiles playing the role of ball winner in front of a back four marshaled by the superb Bobby Moore, England were a very difficult team to play against. Ramsey’s success was based on solid defence, but he also had a superb midfield general and match winner in Bobby Charlton to help generate goals. 4-4-2 was to become the norm for years to come. Fads come and go, especially football formations. Putting labels on formations is always tricky, as would be the case in Paul Jewell’s side that won promotion to the Premier League in 2005. Dave Whelan had forked out what was a lot of money at the time for twin strikers who would both score more than 20 goals that season.The names of Nathan Ellington and Jason Roberts are etched into the history of the club. They were fed from the right wing by Gary Teale, as Campbell and Stanley had supplied Lyon and Davenport some forty years before. However, on the left flank was converted centre forward Lee McCulloch. McCulloch could not in any way be called a winger – his role was to bolster the midfield and ghost in at the far post to poach goals, with the opposition defence being occupied in coping with ‘The Duke’ and ‘JR’. The formation they played was usually referred to as 4-4-2, but it could be argued that 4-3-3 was a better descriptor. Wingers are back in fashion in modern football, although they are expected to play their part in defensive duties too. But many managers shun the idea of playing with twin strikers, preferring to deploy a lone centre forward with support coming through from midfield. Up against two central defenders the lone centre forward has a difficult job. He is not only expected to hold-up the ball when he is almost always outnumbered, but also to score goals. Inevitably the goalscoring ratio of the modern centre forward, in terms of goals per game, has dropped over the years. In terms of holding up the ball Marc-Antoine Fortune is the best centre forward that Latics currently have. However, his goalscoring ratio for Latics is low even for a modern day lone centre forward – a meagre 1 per 10 games. Although Fortune’s career average is higher – almost 1 in 5 – it is bettered by those of Andy Delort (1 in 3.4) and Oriel Riera (1 in 4). How much longer will Rosler continue to play Fortune at the expense of the other two? If one trawls the social media and fan forums there are lots of supporters who advocate the kind of attacking approach that uses two wingers with two central strikers. Many refer to it as playing 4-4-2 although it is probably more akin to the older 4-2-4. Over these pasts weeks several fans have advocated starting lineups that include Callum McManaman and James McClean on the wings and Delort and Riera as twin strikers. It brings back memories of the days of Allan Brown. But it is something that is unlikely under Uwe Rosler or any manager who might succeed him. Most prefer the security of a packed midfield rather than risk putting too many players far forward. Were Rosler to suddenly have a paradigm shift and choose such an attacking formation the reality on the pitch would be something different, with players having to drop back to help a beleaguered midfield? Some managers like to stick to a set formation and recruit players who can fit into it. Rosler is not one of those. His players are expected to adapt to whatever formation he decides upon, which in turn can often depend on the opposition his team is to face. Having a set formation has its advantages. Roles are clearly defined and players can slot seamlessly into the system. However, it also makes it easier for the opposition to plan their strategy well in advance. So far this season we have seen formations that can be broadly labeled as 3-5-2, 4-3-3 and 4-4-2. In recent games Rosler has operated a modified 4-4-2. He has deployed three central midfield players, with Roger Espinoza playing further forward than the other two. He has used Don Cowie in right midfield to provide cover for the attacking runs of James Tavernier from the full back position. Fortune has played the target man role with Callum McManaman in a more fluid attacking role. From time to time Rosler has used a 4-3-3 system with two genuine wingers in McManaman and McClean. The formation offers balance, together with a direct threat to the opposition defence coming from both sides of the pitch. However, both McManaman and McClean need to see a lot of the ball to be effective and this has not always happened. An alternative would be to use Shaun Maloney and Martyn Waghorn in wide positions, with a tendency to move inside. Both have been more consistent goalscorers than McManaman and McClean. There are those who do not like the 3-5-2 system. They say that it often reverts to 5-3-2 with the wing backs not supporting the forwards. But when properly put into practice it can yield good results. Moreover the squad is well stocked with good quality central defenders and Rosler has lots of options when choosing a back three. He has the aerial power of Leon Barnett and Thomas Rogne to counter those teams who rely on route one football. In Emmerson Boyce and Ivan Ramis he has players who have proved themselves to be as good as any central defender in the division. Some players thrive more in some tactical formations more than others. James Perch is a solid and dependable right back who has worked hard when pressed into action as a wing back. His attacking play has undergone a significant improvement over the last year. Perch is a fine athlete with good lungs, as evidenced by goals he has scored through getting into positions where he would not have been expected to show up. However, Tavernier has more to offer going forward. His delivery is so often of real quality. But he needs to work hard on the defensive aspects of his game. One recalls the promise of Ronnie Stam going forward, but he just did not have enough defensively, even as a wing back. At this stage Tavernier looks a good possibility as a wing back or as an attacking option at full back later in a game. Perch remains the best option at right full back. With three games in less than a week Rosler has already made it known that he will be rotating his squad for the away games at Brighton tomorrow and Bolton on Friday. Delort and Rogne made appearances for the development squad last week and are likely to feature in at least one match. It is to be hoped that Maloney‘s goal against Fulham will help to kick-start his season, which has been disappointing up to this point. Waghorn was a key element of Rosler’s system last season, but has seen little action up to this point. Riera too has seen little playing time over recent weeks and is overdue to return. Latics have looked at their best this season when they have been able to deliver the high pressing game that the manager espouses. The ability to do that seems to outweigh the tactical formation he chooses to adopt. Where will Latics’ goals come from? Uwe Rosler was making a valid point. Fulham recently paid £11m for Ross McCormack , a 28 year old forward who has never played in the Premier League. Then Nottingham Forest paid £5.5m for League 1 striker Britt Assombalonga. As Rosler said, Wigan Athletic are certainly being driven in a responsible way. Fulham have clearly decided to splash a significant portion of their parachute payments on McCormack in an effort to get back to the Premier League as soon as possible. In Wigan’s case the parachute payments have been used to payroll a large squad. Despite not being involved in the Europa League this year, Latics maintain a squad size comparable with that of last year. With so many players having been out of action over the past couple of years, maintaining a large squad can be seen as a safeguard in case the abnormal injury load continues. A lack of funding continues to stymie Rosler in his efforts to provide balance to his squad. He is overburdened in the areas of goalkeepers and central defenders, but short on creative midfield players and strikers. It appears that Latics have now given up their quest of signing creative midfielder Adam Forshaw from Brentford, with the London club continuing to ask £6m for a player who is unproven outside League 1. Wigan already have Shaun Maloney, who is as good as any creative player in the Championship division. However, to rest the main responsibility for the creation of goals on the shoulders of someone with Maloney’s injury record would be folly. Wigan Athletic are not the only club who need a goal scoring centre forward and those who are available from English clubs are either prohibitively expensive or no better than what Latics already have. Should Rosler not be able to get the new striker he seeks he will have to persevere with those already at the club. What kind of conversion rates (goals per appearance) do they have? Looking at a player’s conversion rate through the course of his career and comparing it with that at Wigan provides food for thought. Up until the start of the current season, Grant Holt had scored 180 goals in 467 appearances throughout his career, a conversion rate of 39%. Last season he scored 2 goals in 16 appearances for Latics, a conversion rate of 13%. Holt has played in all four divisions, but his conversion rate stayed around the same level in each. In two seasons of Premier League football with Norwich he scored 25 goals in 76 appearances, a conversion rate of 33%. Stats from Wikipedia. McManaman’s career stats include his loan spell at Blackpool. It was rumoured that Latics were interested in Cameron Jerome from Stoke City, but the player has now signed for Norwich for a fee of around £2m. He has a career conversion rate of 22%. Grant Holt is now 33 years old and although he is probably past his best he is a proven goalscorer. But not only has he become the object of abuse among fans on the social media, but he has been ostracized by his manager. Despite being among the highest wage earners at the club he has been sent to train with the under 21 squad and has no assigned team shirt number according to the club’s official website. With his financial constraints Rosler may be unable to secure the services of a new player who has a proven goal scoring record. He may also be unable to offload Holt to another club before the transfer window ends at the end of the month. If this becomes the case will Rosler consider waving an olive branch in Holt’s direction? The big Cumbrian might not fit into the mould that Rosler requires, but a few goals over the coming months might well make him a target for other clubs in the January transfer window. Holt has made efforts to lose weight and surely would not want to be left out in the cold indefinitely. Could Holt have a part to play over the coming months, even if only as an impact substitute?